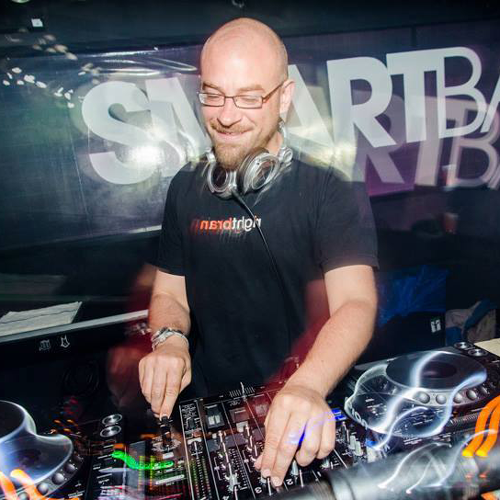 Nate Manic’s presence on the Midwest dance scene can be described as nothing less than ubiquitous, with hundreds of appearances at the region’s best venues and events over a career spanning 10+ years. Always setting high goals and looking to the future, he continues to be a respected member of Chicago and the Midwest’s history with significant contributions to it’s dance community. Originally from a small town south of Green Bay WI, Nate first discovered dance music through a year-long exchange program to Germany. Already a child prodigy who learned to play organ at 2, sing at 11 and play guitar at 13, he fell in love with the sound and made it a point to learn as much about this burgeoning culture as possible. Upon return, Nate furthered his musical education through a 4-year, full-tuition music scholarship for voice to UW-Madison. Unfortunately the university environment was not for him and he withdrew from the UW in order to attend the Madison Media Institute and attain an Associates Degree in Music Recording Technology. In 1997, Nate bought his first pair of turntables and started doing regular nights at the Cardinal Dance Club, a mainstay on the Madison WI scene. Nate garnered a fair amount of respect there, showcasing his skills and putting on events with DJ/producers including Robbie Hardkiss, Halo, Sleepy C, Doran and a host of local up-and-comers. In 2000 Nate moved to Chicago, where he took off very quickly on the local scene through performances at Pure’s Future Sound of Chicago showcases, Smart Bar, Crobar, Big Wig, Zentra and guestpots all over the Midwest. More invitations came in, with gigs at London’s Cross, Hawaii’s Sunnlounge, Milwaukee’s Summerfest and Pridefest, the notorious Burning Man festival in Nevada and other spots performing with DJs including Ian Pooley, DJ Krush, Derrick Carter, Juan Atkins, Kaskade (whom he’s appeared with a solid half dozen times at Smart Bar), Colette, Luke Solomon and others. In 2003 Nate took over as Music Director and promoter at Wicker Park’s popular see-and-be-seen lounge Moonshine, where his Thursday night event, Therapy, continued for more than 3 years and played host to the Midwest’s top DJ talent. In addition to his very successful Sunday Morning Funk and Soul Brunch there, Nate also came on as an occasional Saturday night resident. Around that same time Nate started doing production work and released his first EP, “Arcade Beats”, on Chicago House icon Lego’s imprint Poontin Muzik of January of 2007. He soon founded his own label, Bad Advice Inc., which concentrates on the techier side of House Music. So far he has been fortunate to work with some of the top talent from around the world, including Derrick Carter, James Curd, Tommy Largo, HeavyFeet, 2007 Ministry Of Sound Mix competition winner Tom Simmons aka Cheap as Chimps (who released his debut EP in 2008 on Bad Advice), former Greenskeeper front man Nick Maurer, Gene Farris, Brian Heath, Angel Alanis, Full Phat, Genna Greene and more. In October of 2009 everything changed as Nate was named the new Music Director for Chicago clubbing institution Smart Bar. Since then he has striven to book a wide range of talented and deserving artists both locally and from around the world and hold the bar high for this highly-esteemed club. Respected luminaries and tomorrow’s stars alike have held stage under his tenure already, and a fresh crew of residents and 2 new weekly events are just some of the changes he’s made to the program in his short time there so far. And with guest spots one-offs around the city and Midwest as well as regular appearances at Smart Bar, he remains busy as a DJ and regularly enjoys the art. 🙂 And Nate’s dedication to the underground has still remained strong as he and the Bears have reached minor celebrity status within the regional Burning Man community. A regular performer at Chicago’s yearly 1,200 person-strong Resonate event and Chicago’s best underground monthly the Freakeasy, Nate will be heading up a return trip to the Nevada festival this August for a week-long romp in the dust filled with DJ slots across the playa. Nate Manic It was a field rave in Germany in 1992- no idea who was playing but it was amazing and I knew then that I had to explore this music and scene more. Made it a point to go to every rave in Milwaukee & Madison after I got back. Nate Manic John Acquaviva & Richie Hawtin on the world level, and Nick Nice & Mindrive on the local level… all huge influences and I studied every mix and set I heard from them to learn how to properly blend tracks. Nate Manic Berghain/Panoramabar Berlin! Such great energy. Apart Do you have any of your productions out? If so on what labels? Otherwise Do you have any podcasts or radio shows you would like to mention? Nate Manic I have a podcast at http://djnatemanic.podomatic.com and I’ll be putting up a Mixcloud in the next few weeks as well… as far as production goes my first EP came out on Lego’s Poontin Muzik back in 2008, and I also have a record Label, Bad Advice Inc., which has been dormant for the last few years but is getting resurrected in the coming months. I’m also back in the studio again and am currently working on a project with Rashaan Houston that I hope to finish up and release by the end of the year. Nate Manic I have a bunch of Indian Ragas that I play at home, also Laurent Garnier’s continuous radio show http://www.pedrobroadcast.com/ and I have a series of hour long nature recordings that chill me out a lot. Nate Manic THE PEOPLE! I’ve met/made so many great friends here over the years and have some great memories with them. I would also say that THREE was one of my favorite things about the city as well, although it’s been closed for many years now.